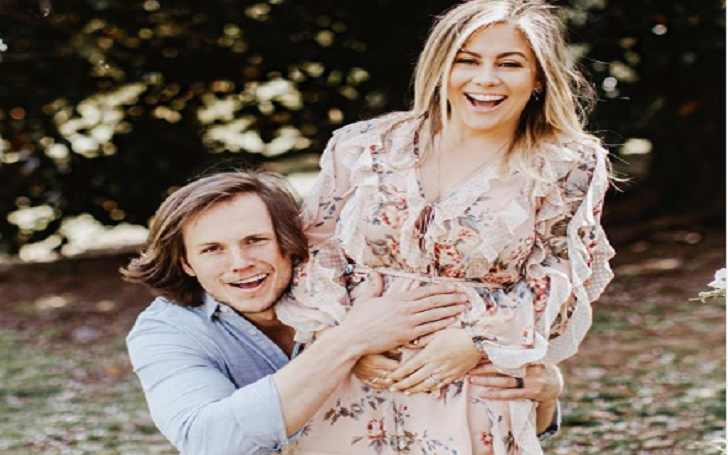 Baby on board for Shawn Johnson and Andrew East! The Olympic gymnast and the Washington Redskins are expecting their first child together, more than a year after suffering a miscarriage. The Olympian, 27, took to Instagram on Thursday, April 4, to announce her pregnancy, with sharing a photo of the parents-to-be in which she shows off her growing baby bump. She captioned the post, "Baby East… we cannot WAIT to welcome you to the world and shower you with love. @andreweast WE DID IT! #pregnant." Johnson, who won the Dancing With the Stars season 8, cradled her bump in a floral dress in the photo as her husband, also 27, pointed to it with a smile. The NFL player, for his part, shared a video on his Instagram, writing, "Coming 2019 @thebabyeast," to share the exciting news. The upcoming baby already has an Instagram account, featuring four photos, including a "Baby East" napkin pic and a sweet shot of the dad-to-be cradling his wife’s stomach. As previously reported, the couple revealed in October 2017 that they had suffered a miscarriage. The past 48 hours have been some of the happiest, scariest, and saddest times of my life. My husband Andrew and I found out that we were unexpectedly pregnant, only to find out hours later some tragic news. I have been crying more than I ever have, but am still optimistic for what is next. The couple became married in April 2016, nine months after getting engaged. The linebacker had popped the question at Wrigley Field in Chicago.